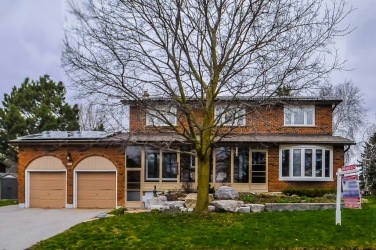 beautifully updated 4+1 bdrm, 4 bath family home on quiet cul de sac w permitted sep. entrance to in-law suite! $140,000 spent in 5 yrs: reno'd kitchen, hi eff furnace, keldan windows, shingles, doors, hrdwd flrs (main), broadloom, gas f/p, cvac, wtr sftnr, frt porch encl & r50 insul. since 2012. full energy audit *fully owned solar panels yield $8000 income/yr pd by nmkt hydro* steps to great parks, schools (engl/french imm. ), hospital, library & more! extras:all ss ge profile appl, fridge/stove bsmt, elfs, all window covers & silhouette blinds, gas fp, cvac/attach, water softener, cac, gdo/4 rmts, b/i shelves garage, shed, gazebo, swing, shingles, storage loft in garage, extra storage in bsmnt.